Electronic signs direct drivers to recommended exits. Cash customers are directed towards lots on the outer edges of Lawrence Expressway and Highway 237 or Great America Parkway and Interstate 101. Nearly 30,000 parking spaces are available in 28 lots. Cash lots start at $40 per game. Blue Lot 1 and Green Lot 4 serve as drop-off and pick-up locations for the disabled. Tasman Drive next to the stadium between Centennial Blvd. and Great America Parkway will be closed to all traffic. Tailgating is not allowed until 9:00 a.m. in the California’s Great America theme park parking lot, Santa Clara Golf and Tennis Club parking, or stadium parking areas within the security perimeter by the Green Lot. 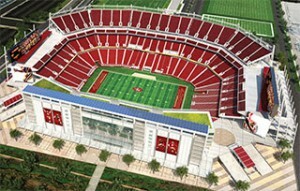 Levi’s Stadium is easily accessible from Interstates 101 or 880 via Highway 237. See this link for directions to Levi’s Stadium. There are numerous parking locations at Levi’s Stadium and in the immediate area. See this link for a parking locations map. In addition to three regular bus lines with regular service to the area, VTA will run five special bus lines to the stadium on game days: Line 252 from Vallco, Line 253 from Gilroy, Line 254 from Eastridge and Line 255 from Almaden. There will be three trips to arrive at Levi’s Stadium from 2 1/2 hours to 110 to 70 minutes before the start time of event. BART-bus Line 251 from Fremont will operate every 20 minutes from there to the Great America light rail station, meeting each BART train starting three hours before kick-off. Caltrain is making it easy for customers to get a ticket for both rail systems by selling a joint Caltrain/VTA Day Pass through its station ticket machines. The Day Pass will be good on Caltrain through the end of the service day and until 3 a.m. on VTA. Fans paying with a Clipper card are reminded to tag on and off Caltrain then tag on VTA. The new joint ticket must be purchased the day of travel to be valid. Caltrain is a proof-of-payment system, and tickets must be purchased before boarding the train. Those without a valid ticket, including Clipper tag, are subject to a citation and fine. Caltrain reminds fans to drink responsibly and to remember that alcohol is not allowed on game-day trains beginning at 9 p.m. VTA doesn’t allow food or beverages on its light rail vehicles and buses. Riders are dropped off on Tasman Drive at Great America Station across from the stadium – just a 10 minute walk away. Light rail trains operates for an hour after a game. Four extra trains will run from Alum Rock and Santa Teresa and three extra trains from Diridon Station every half-hour. Riders will not be able to use ticket machines on platforms between Mountain View and Great America, so purchase tickets ahead of time. Caltrain operates two extra trains after games. Take either light rail or a bus from Mountain View. Amtrak Capitol Corridor train runs from Sacramento area to a block from Levi’s Stadium. In the Oakland area, you can catch the Capitol Corridor train at Emeryville, Jack London Square or near the Coliseum/Airport BART stop. The Altamont Corridor Express (ACE) train will run one train to all 49ers home games from Stockton. The train stops at Great America Station. For 1:05 p.m. games, the train will arrive at 11:41 a.m. and depart at 5:31 p.m. From San Francisco and the Peninsula, the best way for fans to get to Levi’s Stadium is on public transit aboard Caltrain. Exit Caltrain at its Mountain View station and from there transfer to VTA Light Rail for the trip to the stadium. 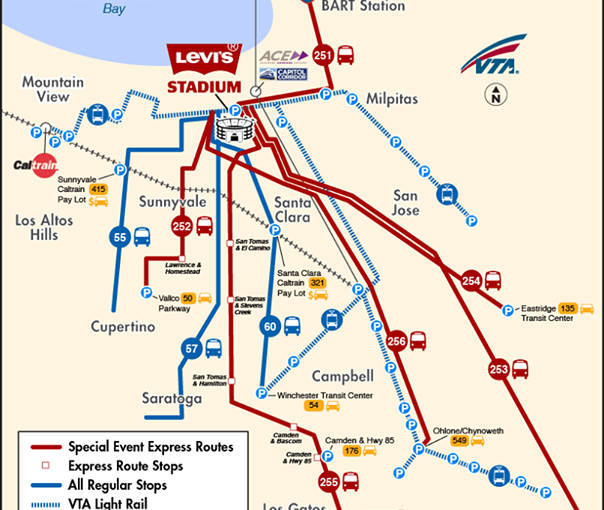 There are a number of public transportation options to Levi’s Stadium depending on where you are traveling from. Caltrain also will add extra trains to meet the anticipated demand. For Sunday afternoon 49ers games, Caltrain will operate two additional southbound trains that depart San Francisco at 9:35 a.m. and 9:55 a.m., and make all local stops to Mountain View. Special service train schedules will be adjusted to reflect later kickoff times. After 49ers games, two special trains will take passengers from Mountain View back up the Peninsula to San Francisco. The first train will leave 45 minutes after the game or when full and the second special service train will depart approximately 25 minutes later. Regularly scheduled northbound and southbound trains will also serve the Mountain View station on game days. Valley Transportation Authority (VTA) Light Rail includes service from Alum Rock and Santa Teresa in San Jose to the stadium as well as additional Light Rail trains to supplement the current service from Mountain View Caltrain and downtown San Jose. VTA is also introducing several event day-only express bus lines that will offer direct service from many Park & Ride lots. The San Tomas Aquino Creek Trail will be temporarily closed between Agnew Road and Tasman Drive during event days at Levi’s Stadium. Bicyclists will be rerouted via Agnew Road, Lakeshore Drive, Gianera Street, the VTA Great America Train Station Parking lot, Stars and Stripes Drive, the service road/trail along the rear of the Tasman parking garage, and then back to the San Tomas Aquino Creek Trail. Pedestrians will be rerouted via Agnew Road, Mission College Blvd, Great America Parkway past the Santa Clara Convention Center, and then back to the San Tomas Aquino Creek Trail.